After a number of years in PYP, most teachers lose track of how many Post-Its they have used: in workshops, in meetings, and hopefully also in class. I used to roll my eyes when those little yellow packs would come out, but when I started thinking about how to use it in my own teaching, I too became an addict. Post-Its are great for a plethora of activities. 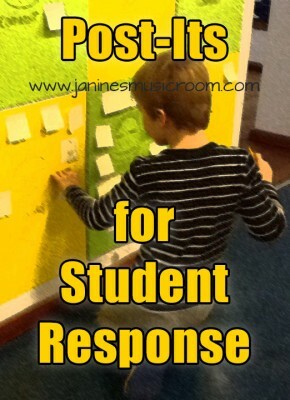 Students can mark choices, write comments, have uninterrupted “conversations,” chart responses…the list seems endless! I had a technology failure one day and ended up having a Post-It-based lesson that was even better than the one I had planned. The students were exploring classroom instruments and making connections to emotions. 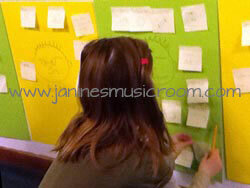 As students rotated around to all the instruments, they drew and labeled each instrument on a Post-It, then added it to a poster depicting an emotion. Every student had to quietly make his or her own choice. 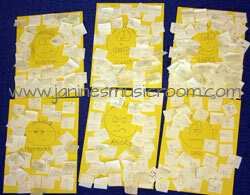 Every student drew and wrote the name of each instrument, strengthening those synapses. And we ended up with a clear visual over which we could observe and discuss patterns. What are your favorite uses for Post-Its?